Once or twice a year most of us get the chance to let loose and spend our hard earned vacation money on the next “trip of a lifetime”. In a world where Google can help us get that split second answer to trivia that would keep us boggled for weeks in the past, we have also adapted instant vacation plans. Air Bnb brought us the ability to join a community with the click of a trackpad. While this provides great accommodation when visiting a new city or friends, it can add an insane amount of stress when planning an expensive yacht charter. Just a short flight from the comfort of your home we have the perfect solution for whatever travel experience it is that you’re looking for. Day Yacht Charters can take you out, in any one of our destinations, to enjoy 365 days of sun and sea. Enjoy breathtaking views, whale watching, snorkeling, watersports, dining, and drinking, in the ultimate luxury with the day charter yacht of your dreams. We at Day Yacht Charters can guarantee that you enjoy your voyage by following our philosophy, “Vacations should not be stressful at all!”: Leave your Luxury Charter up to us with an all-inclusive charter in any of our breathtaking destinations. 1. 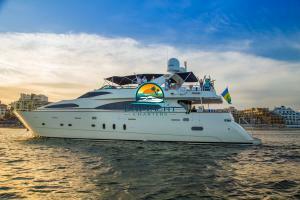 Value - Our yachts come ALL INCLUSIVE! This means that while you can find bareboat deals you will SAVE MONEY by letting us sweat the small stuff. Don’t let the price of building a new grocery list add to the “great deal” the competition offers. Never forget anything at home! 2. It's YOUR trip! - By working with one of our charter specialists you can design the trip of your choice. If you are building a romantic dinner with a breathtaking sunset view we want to make sure that is exactly what you get. 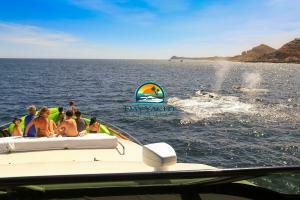 From swimming and snorkeling to whale watching we have the right trip for you. 3. NO STRESS - Let your guests be guests. Don’t stress over shopping lists and food preparations or beverage plans. Our Chef and his team will have your boat stocked with everything you need. 4. NO Cleaning - Don’t waste one minute of your trip cleaning! 5. 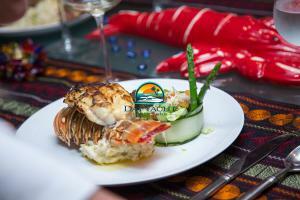 Focus on Food - Let our Executive Chefs focus on your food and when it is served. Everyone can be up enjoying the deck while our team prepares your 5 Star meal. 6. The Package - When booking your Yacht Charter you are booking an experience. Ask all of the questions that you might have and help us with as much information as you can so that we can build the perfect package for you. This is YOUR VACATION! The next time you are thinking of traveling to Cabo San Lucas, Puerto Vallarta, The Caribbean and Bahamas, Grand Cayman Islands and many more, consider Day Yacht Charters in helping ensure that your friends and family have the experience of a lifetime. For a list of our destinations and vessels please visit us at www.DayYachtCharters.com and start planning your trip with one of our charter specialists today!